I have braised less tender cuts of meat. I fixed the country ribs in the recipe book. They were great. Who'd have thought of using Dr.Pepper. Made spaghetti sauce. Also as good as any I've fixed. 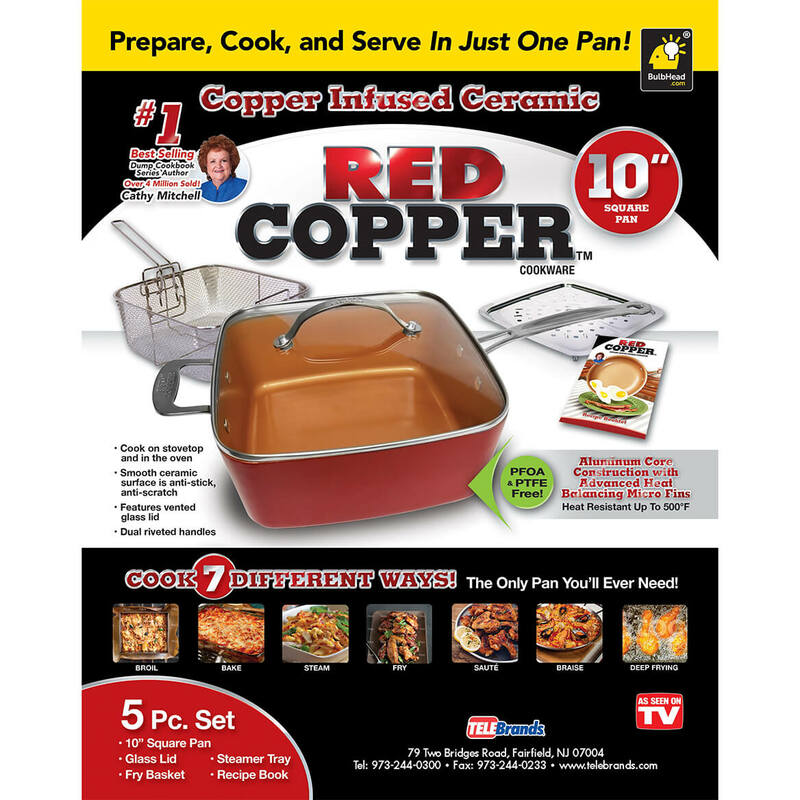 Service was great,the red copper pot is so good. This pan is as awesome as advertised! i had been using a dutch oven to fry foods and it always got gummy around the top edge and was a pain to clean. This pot is perfect, cleans up like a dream! The basket is roomy and soooo handy. Havent roasted anythng in it yet but I'm expecting the same quality performance. I love this product. The price was great. It cooks great. Great for baking Chicken and other foods. Every single item is great quality. Can't wait till next order. rhis product would be ok, if the edges weren't so sharp. the color on the panm starts to turn blackish on the first use.i could go on and on,but ill just say etc!!!!! I have the round set and want the square set also and the others are for my daughters. We love these. A friend purchased this and I loved the way it cooked. Need an item like this..
i,m want to cook with less oil. It works and I bought it for my daughter. I have been drooling over the commercials for this!!! All of my pans are at least 10 years old. There are not the best quality and they have run their course. I love frying evenly and the corners will give me more room. My daughter is the cook in the family...she's been wantng some of these pots, so I am purchasing them for her. I wanted to try the copper cooking. Been waiting for a chance to order. Looks like a good deal on the TV. If this does what it says it will do, it will be perfect for cooking family dinners! because they have them on tv and my sisters have one. Because it sounded like a good idea. I love the square one that I purchased! Is it really only 8 inches square or is that a misprint? BEST ANSWER: Thank you for your question. 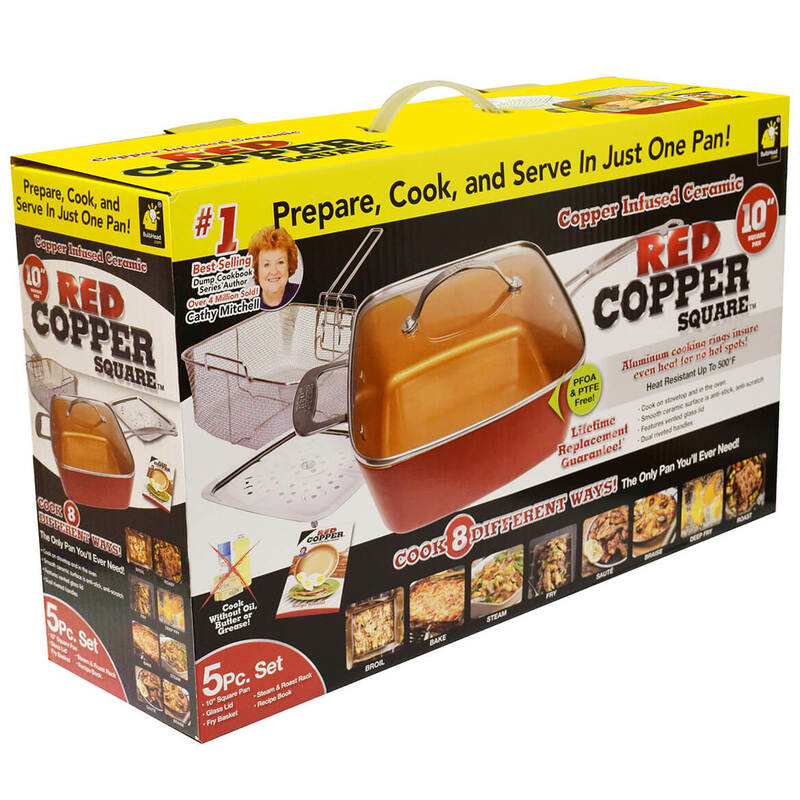 The set includes 1 8" sq x 4" D Red Copper Pan, tempered glass lid, steam rack and frying basket and a recipe guide. We hope this information will be of help to you. Have you cooked 2 different foods at one time? BEST ANSWER: Thank you for your question. It is possible to cook more than one type of food in this. We hope this information will be of help to you. 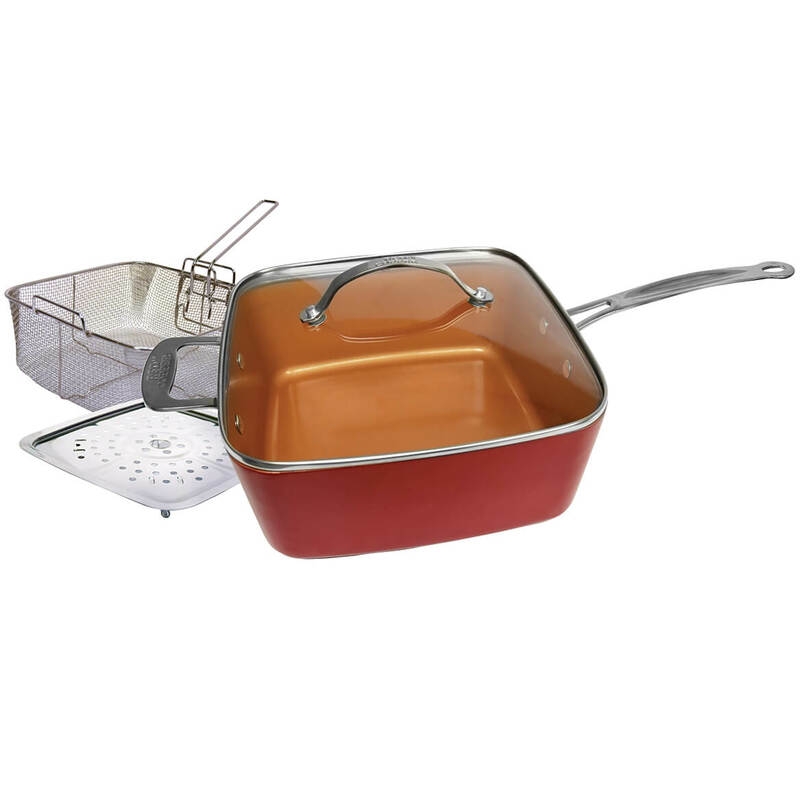 358283 copper pan what size is it? BEST ANSWER: Thank you for your question. 8” sqare x 4”Deep. We hope this information will be of help to you.